Welcome to The Gods Are Bored, where we find our mission accomplished! Many bored deities of many pantheons are no longer bored. They have growing praise and worship teams who are seeking to communicate with them genuinely, humbly, and with curiosity. That's all a deity really wants. I should know, I've interviewed dozens of Them. I've come to an end of the road. I find I have trouble infusing my life -- and this blog -- with the humor that once animated it. But before you bag The Gods Are Bored, pick a year. Any year. I wrote a lot of funny stuff, and it's all still here online. You could literally read me three times a week for five or six years. Some of the political screeds are stale, but the rest of it, the interviews, social commentary, and Pagan child-rearing, hasn't changed. And maybe I'll re-discover my funny bone. There are many reasons that it has disappeared. I'm hopeful it will return in the fullness of time. 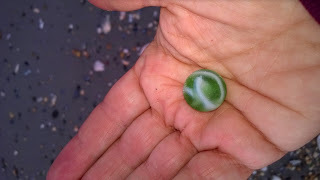 Yesterday I got up at 4:00 a.m. to go to the beach for one of my favorite pastimes, collecting sea glass. When I got to the beaches on Absecon Inlet, they were covered with bulldozers and chain link fences. Somehow, economically depressed Atlantic City has found money to construct a sea wall straight down the inlet, so that the five sea glass beaches will disappear. Two of them were already off limits. 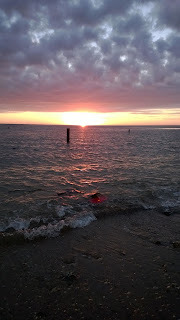 I watched the sun rise over one of the smaller beaches that has yet to be bulldozed. It was so peaceful and beautiful. The tide was going out, and the waves lapped gently on the shore. This realm of King Triton and Queen Oshun will be altered because storms like Hurricane Sandy impinge upon the high-end real estate in the area. The sea wall is being constructed by the Army Corps of Engineers, those humans who seek to impose their will on the Goddess, to little avail. I had bonded with this stretch of beach, pleased that it soothed my aching longing for Appalachia. Now I'm aching for Appalachia and Absecon Inlet. Change, change. Daughters grown, farm sold, beaches bulldozed, aching joints, vultures no longer wintering in the area, dissolution of spiritual bonds. Can't shrug things off like I used to with a la-di-dah. Yesterday was my swan song at the sea glass beach. The God and Goddess took pity on me and gave me a parting gift that will forever be special in my heart. Where do I go now? There's one more post I'll put up. Yet another agent has showered my novel, Gray Magic, with indifference. Therefore, my next post will be the PDF of Gray Magic. It's yours, free, to shower with your own indifference. It's not perfect. It needs the editorial hand it never got,because it didn't ever get that far into the process. Still I think it's a good story, with a real ending. Here's my gift from King Triton and Queen Oshun. It's my fourth and final beach marble. All glory, laud, and honor to the Deities of the Deep!